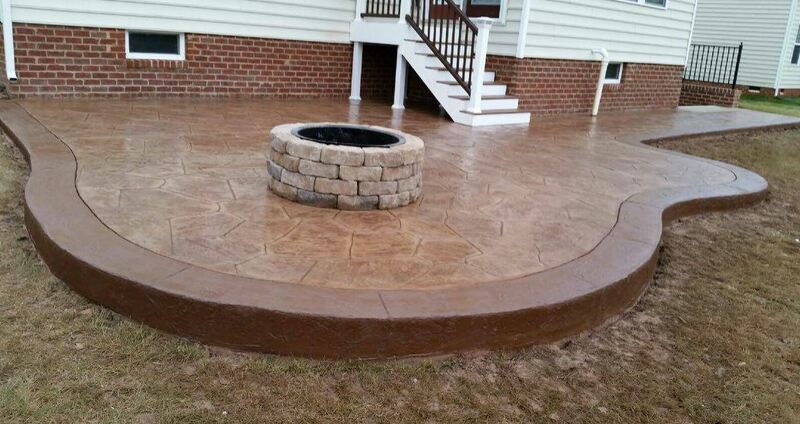 Looking for a decorative or stamped concrete finish for a new patio or driveway? Maybe you're more into broom finish or simple stained and polished concrete. No matter which one it is, we are the contractor serving Suffolk, Virginia that can definitely help and would love to provide you with a free estimate on the project. We offer a ton of concrete services and will be happy to help you choose the right one for your project . We're at (757) 347-8337 and are looking forward to helping you transform your residential or commercial property. ​If you live in Suffolk VA and need reliable and professional concrete service provider, you've come to the right place. We offer a full range of top notch services for your driveway, patio, slab and sidewalk, and our mission is to help home and business owners create the type of outdoor space they'll love. We take pride in being among the very few contractors who offer seamless quality at affordable prices. When you ask us for a quote, we always make sure we include everything right off the bat, so you don't have to face hidden costs or any other such inconveniences, should you choose us for your driveway or patio project. Our technicians have a wealth of experience with various stained concrete projects, so you can rest assured they can do just about anything you could possibly imagine. Their creativity helps them find the best solutions to integrate your alleyway or your barbecue area into the overall design of your property. We work with expert architects and landscape designers, in order to exceed the expectations of our clients. Our business philosophy puts the client in the center of all our activities. With us, you don't have to worry about your like and wants not being taken into consideration. We are aware of the fact that one single detail can ruin the look of a home, so we are always willing to listen to our clients with the greatest care. If you want to see some proof of what we can do, you are welcome to contact us. One of our customer representatives is going to show you a few of our completed projects. You may even visit some of these properties, in order to see the result of our efforts with your very eyes. We've been serving the local community since many years now, so we have hundreds of works in our portfolio. We understand how important it is to keep pace with modern technology and materials. All our employees are always up to date with the latest news in this industry. This is how we can offer our clients the best materials and technologies available today. Our work is guaranteed to withstand the test of time, thanks to the special sealing techniques we make use of. Moreover, our loyal customers benefit from regular maintenance and repairs at promotional prices. We want to reward your loyalty, so we focus on spotting all potential problems in their early stages, when they are fairly easy and less expensive to fix. Once you become our client, you'll enjoy a beautiful driveway or patio year after year, for a very long time. If you live in Suffolk or in the surrounding areas and you want to spice up the exterior of your house, you are welcome to get in touch with us. Our specialists will help you choose the best solution to suit your needs. We are happy and willing to improve the look of your home, whether you want to sell it or to make it more enjoyable to you and your family.